M1873 Cavalry revolver nickle finish [CA-22-1191N] - $94.00 : Metalcraft by Blair - military gifts and memoribilia. Metalcraft by Blair is presenting another new section in it's web site. 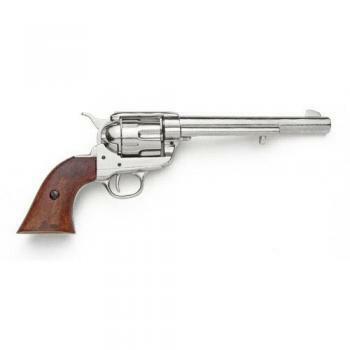 NON—firing Replica---- Pistols and Rifles of the Old West time era.. These guns look and feel like the real thing, but can not fire and can not be made to fire real bullets, Therefore you should not need a gun permit. These guns are so real we ask and urge you to take extreme caution when handling them for fear some one may thing you are shooting at them. The guns are made of metal and wood and have real life action moving parts.